Last July, an online marijuana mogul paid $42,250 to rent a 125-foot “super yacht” for three days, docked next to the San Diego Convention Center during Comic-Con. Brad McLaughlin, CEO of Encinitas-based BudTrader.com, hoped the “party boat” would wow the public, lure celebrities and attract investors. But the promotion lasted only two days, with the yacht Liquidity vanishing on Day 3 — the Saturday morning of Comic-Con International. Now McLaughlin, 33, is suing the business that rented the boat and the company’s owner, Lake Rickolt. In a complaint filed Jan. 19 in San Diego Superior Court, McLaughlin’s Los Angeles-based attorneys accuse San Diego Marine Services and parent rental company Sol Luna Expeditions of breach of contract, false advertising and fraud. Rickolt, 45, did not respond to a request for comment. But his Facebook page lists him as former owner of Sol Luna Expeditions. He now operates a yacht-chartering business on Harbor Island called Sunset Rendezvous using the same phone number as Sol Luna. 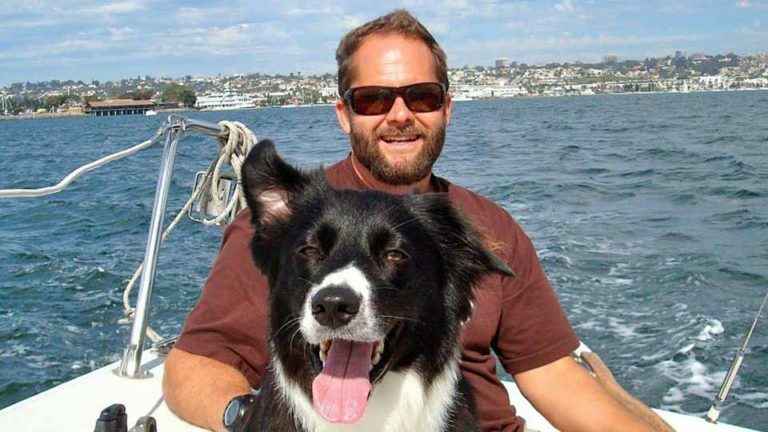 The suit, filed by attorneys Oscar Ramirez and Matthew P. Blair, doesn’t put a dollar figure on BudTrader’s toll, but McLaughlin on Wednesday told Times of San Diego that he likely suffered more than $100,000 in losses. 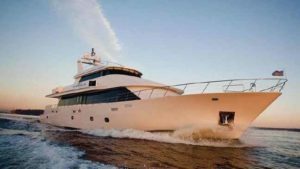 The charter contract was appended to the suit, showing a yacht rental of $30,000, a “repositioning fee” of $3,250, a crew gratuity of $6,000 and taxes of $3,000. McLaughlin is demanding a jury trial. Court records say the case has been assigned to North County Judge Jacqueline Stern, with a case management conference set for Sept. 21. BudTrader, depicted as a “Craigslist for medical weed,” has a history of attention-grabbing promotions. Last March, it boasted as many as 10 “supermodels” handing out hugs and 10,000 free marijuana joints at a cannabis convention at the Sheraton San Diego Hotel & Marina. In August, BudTrader announced it had launched the “very first, Real Time Price Per Pound Cannabis Commodity Index.” (No such index can be found there today.) That same month, it touted “the first TV commercial ever by a cannabis company.” (It never aired.) It also ran a Christmas toy drive. 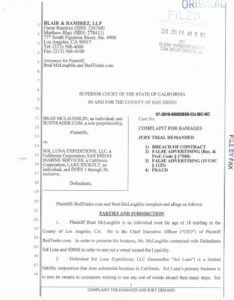 The lawsuit says McLaughlin got no warning that the yacht would be taken away — and his agreement said only bad weather would be reason for it being taken back prematurely. “However, the weather was not, by any means, hazardous on July 22, 2017,” the suit says. Due to the boat’s one-day absence, McLaughlin said he had to cancel vendors, caterers, promotional models, security staff, photographers and videographers. The suit makes no mention of McLaughlin’s theory on why the yacht was yanked. But in July he was confident he knew the culprit: folks aboard a neighboring Turner Broadcasting System yacht.